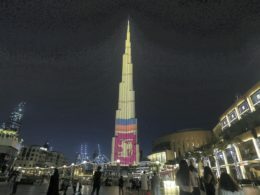 Many new private schools have opened across the Kingdom and are predicted to educate up to 33% of the country’s children by 2020. 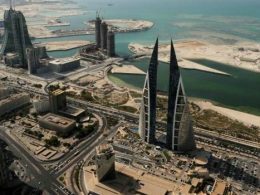 As new private schools spring up across Bahrain, the Government has stepped in to ensure the quality of education for students. The Directorate of Private Schools and Kindergartens (DPS) under The Education and Training Quality Authority (BQA) review, monitor, and reports on students’ achievements and the quality of teaching and learning in private schools and kindergartens according to best international practices. 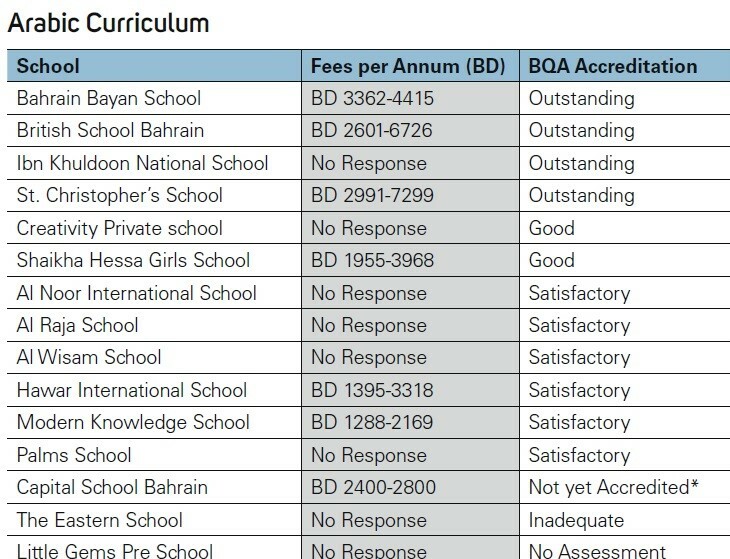 Considering the high demand for private school teaching among the expat and many native parents, Gulf Insider’s July 2018 Education guide featured the five outstanding schools in Bahrain as per the BQA accreditation. However, many of our readers commented on the high fee structure in these schools that not every parent can afford! The main aspects that parents look into while enrolling their children are the curriculum, quality education provided and the fee structure. Where the supplies, uniforms, meals and transportation are free in the public schools, the fee structure, curriculum and facilities vary in each of the private schools. With an aim to provide authentic information to parents on the curriculum, fee structure and BQA accreditation, Gulf Insider collected information from 50 private schools in the Kingdom. Many of the schools were willing to share their information while others denied us detailed information. What is The Education and Training Quality Authority? The Education and Training Quality Authority is an independent entity established as part of the National Education Reform Project, an initiative of Bahrain’s Economic Vision 2030. The main aim of the Education Reform Project is to fundamentally improve the services provided in education and vocational training in the Kingdom of Bahrain. Since 2008 the Authority has embarked on a number of quality assurance activities, including setting performance standards and carrying out objective reviews of all education and training institutions licensed to operate in the Kingdom. BQA hasn’t started to review Kindergartens yet. Arabic curriculum is provided as mainstream in most of the schools that promote bilingual education. British School Bahrain, Bahrain Bayan School, Ibn Khuldoon National School and St. Christopher’s School are accredited as ‘Outstanding’ by BQA. 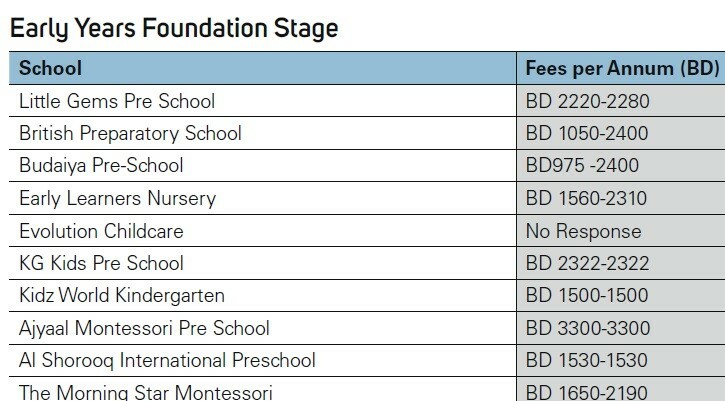 The average fee structure for Arabic curriculum is BD 2284 to BD 4385 per annum. 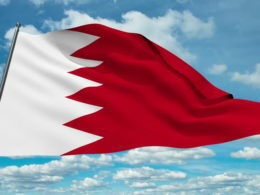 There are 14 leading schools in Bahrain who provide British curriculum. British School of Bahrain, Nadeen International School, and St. Christopher School are accredited as ‘Outstanding’ by BQA. 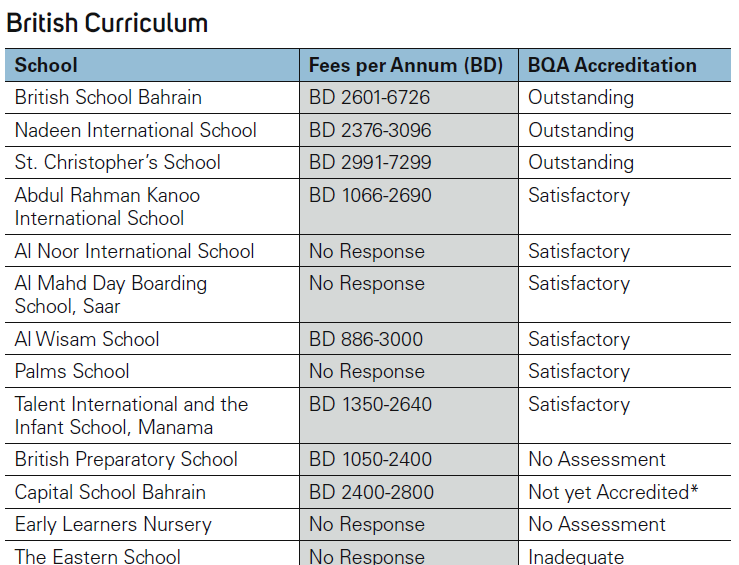 The average fee structure for British curriculum is BD 1840 to BD 3831 per annum. 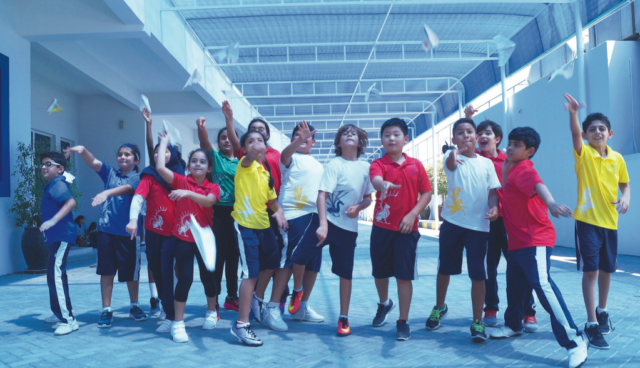 American curriculum – Bahrain Bayan School is a leading name among this category with an experience up to 3 decades and with an ‘Outstanding’ accreditation by BQA. The average fee structure for American curriculum is BD 2256 to BD 4031 per annum. The Indian community has a strong presence in the Kingdom and The Indian School teaches the highest number of students in comparison with any other school in Bahrain. The average fee structure for CBSE (Central Board of Secondary Education) is BD 615 to BD 905 per annum. 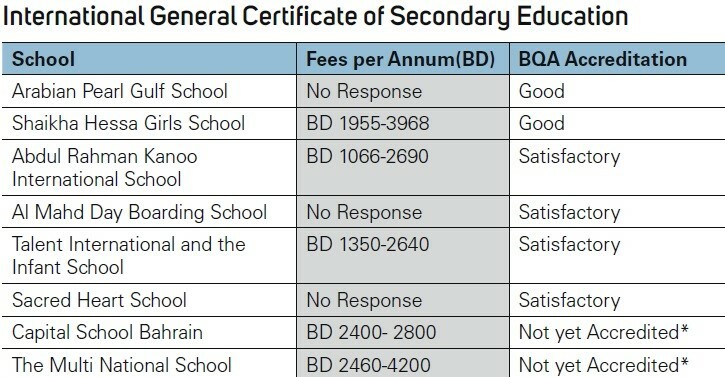 The average fee structure for IGCSE is BD 1846 to BD 3259s per annum. 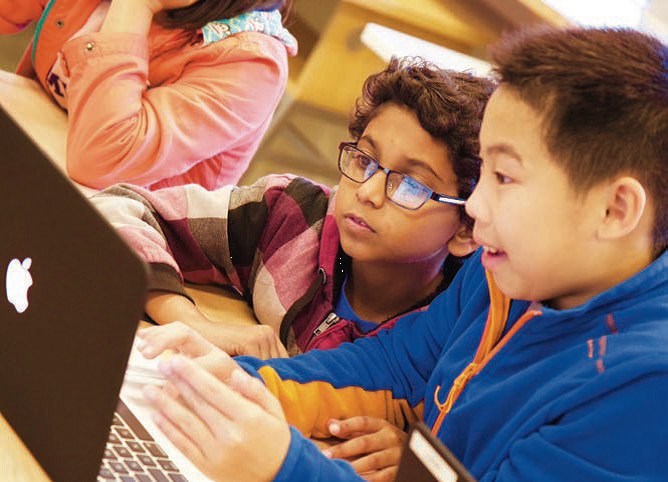 The IB (The International Baccalaureat) curriculum is offered by leading schools like Naseem International School and Riffa Views School in Bahrain. The average fee structure for IB is BD 5413 per annum. The education of children under 5 years has gained much-needed attention over the years. The two curriculums provided for this age group are Montessori and UK EYFS (Early Years Foundation Stage). 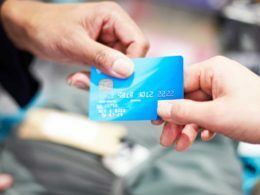 The average fee structure is BD 1789 to BD 2248 per annum. * The accreditation reviews are based on the BQA report 2018. The education of children under 5 years has gained much-needed attention over the years. The two curricula provided for this age group are Montessori and UK EYFS (Early Years Foundation Stage). 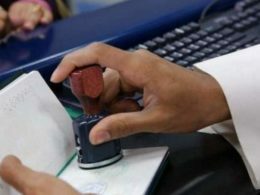 There are also schools providing unique curriculums such as Alia International School, Bahrain School, KIPINA, Pakistan Urdu School, Philippine School, The International School of Choueifat (SABIS) and Japanese School for Bahrain. Unfortunately, we did not receive responses from them to our queries.